Bija Vidyapeeth (Earth University) is Navdanya’s learning center headed by Vandana Shiva, located at the Navdanya Biodiversity Conservation Farm in Doon Valley, Uttarakhand, nestled between the Ganga and the Yamuna, the Shivalik and Himalayan mountain ranges. Navdanya has created a biodiversity sanctuary for birds, butterflies, insects and soil microorganisms, through saving more than 1500 varieties of seeds and trees. Here, nature in its diversity and dynamism is the highest teacher. Bija Vidyapeeth (Earth University) draws inspiration from Rabindranath Tagore, who created Shanti Niketan, a university based on living in and learning from nature. He was also the inspiration behind the Schumacher College, with which the Bija Vidyapeeth is associated as a learning center. 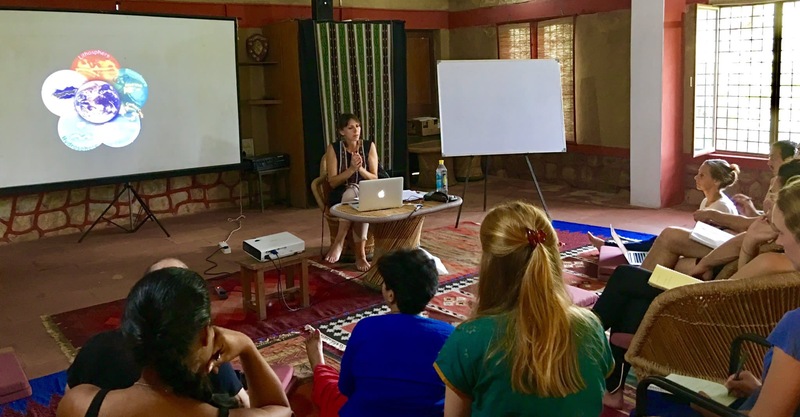 Lecture on the Rights of nature and the Planetary Boundaries was given on 27th September 2017 during the course « A-Z of Agroecology & Organic Food Systems », an opportunity to learn from the cutting edge ecological research combined with practical experience.